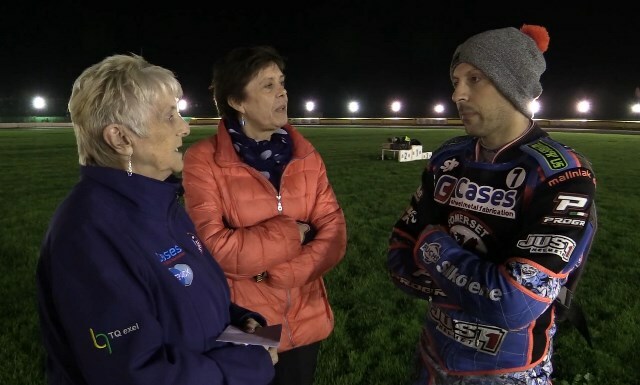 SOMERSET'S knockout cup hero Nico Covatti had three hundred very good reasons why he wanted to do so well for the Rebels in the SGB Premiership Knockout Cup final. Prior to Wednesday night's first leg at the Oaktree, Nico was nominated by the SREF organisers to be the recipient of a £300 handout from the SREF funds and he graciously received a cheque from Di & Anita on the centregreen before the presentation of the riders. Nico played a pivotal role as the Rebels claimed their first piece of silverware at the top level of British speedway, scoring 12+3 in both legs of the final. SREF organiser Di Phillips said "we try and do our bit to help the lower order riders especially, and Nico has been superb for us since he came into the side and we wanted to show him our appreciation and he was very grateful for the donation when we handed it over. I think with those double figure scores he expressed his gratitude in the perfect way for the fans and I too would like to thank everyone who has supported the SREF this year allowing us to be in the position to really give some financial support to the riders."